After my last blog post, I thought we should lighten up the mood a bit. What’s better than food? This recipe has been a hit for my family for a while now. I have been a vegetarian/pescatarian for three years, and I came up with this out of boredom. Food boredom. The entire pan of this was finished in no time at my Friendsgiving party a couple of years ago. 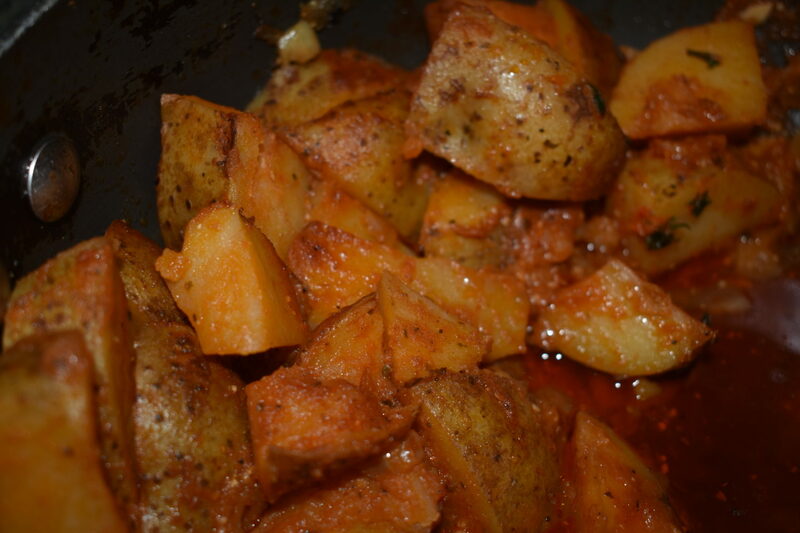 You will need 6 potatoes, tomato sauce, onion, 3 cloves of garlic, a handful of seasonings and cooking oil. 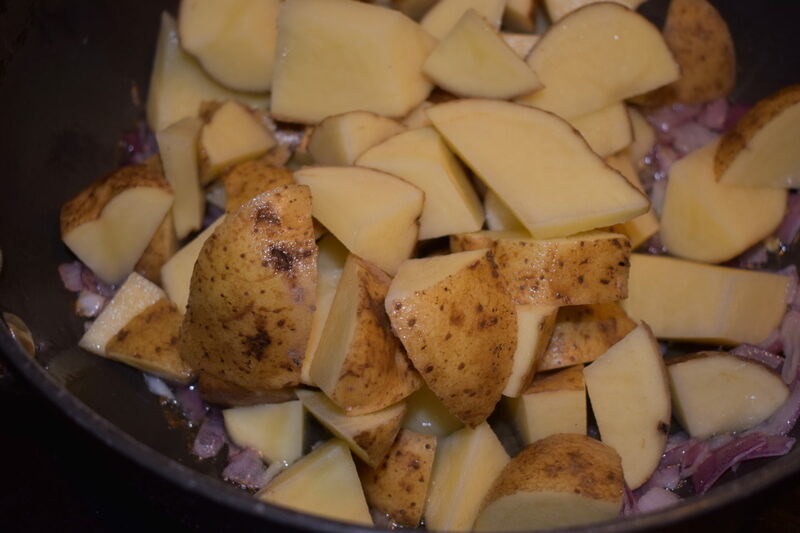 To get started chop up a medium sized onion, your garlic cloves, and the potatoes. I call this recipe skillet potatoes, but I make it in a cast iron pot that comes with a lid from KitchenAid. 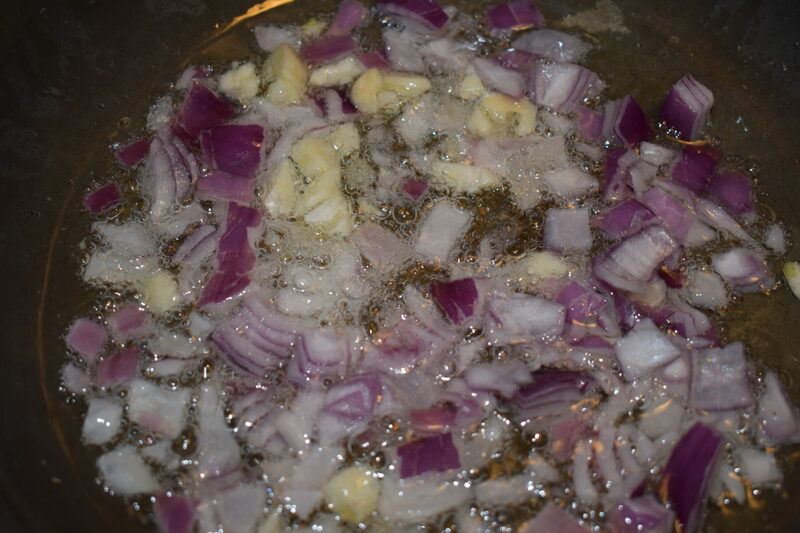 Heat up the pan, add oil, the onion, and garlic. Cook until onions are translucent. When the onions are soft, add your potatoes. I like to keep the skin on, but feel free to peel them off if you prefer. Stir them in with the onions and garlic. I like to let them sit for a few minutes before adding my seasonings. Now I don’t have an exact measurement breakdown to give you as to how you will distribute the seasoning. I just eyeball it and add a couple dashes of each of the seasonings you see above. 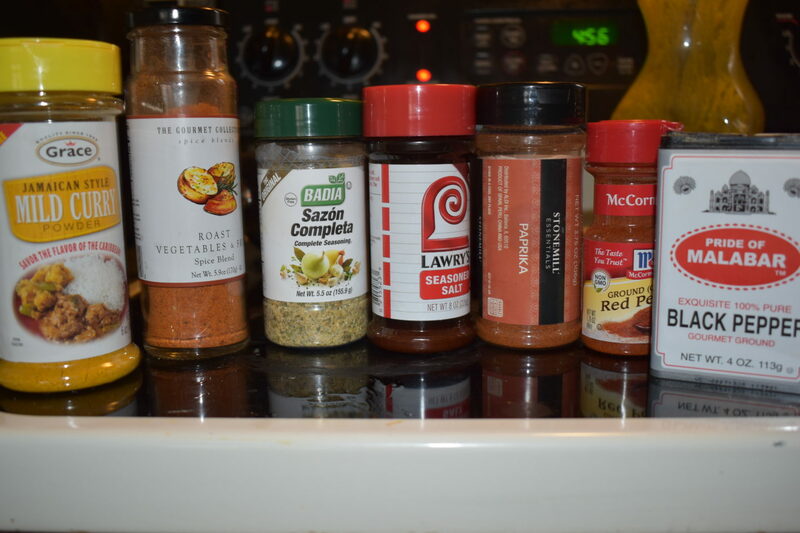 Yes, that’s curry powder, I add it to every vegetable dish. 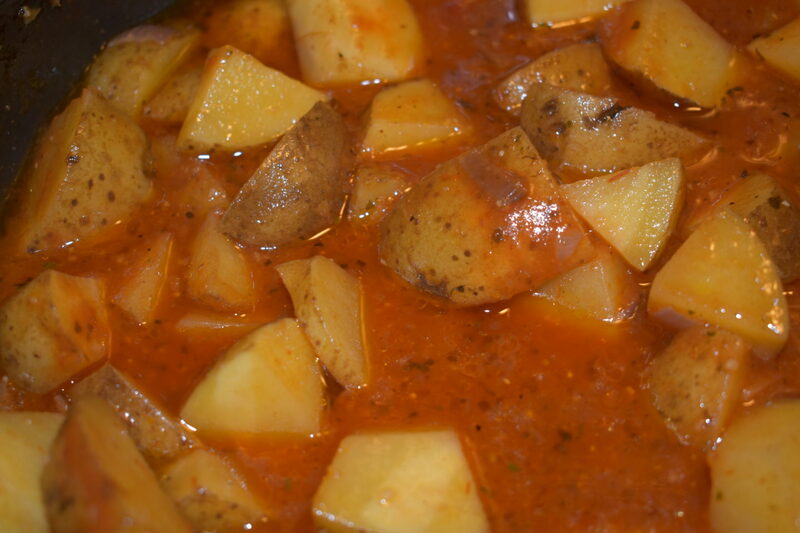 Not enough that you are “currying” the potatoes, but a little for color and flavor. It took me a while when I first started cooking, to realize that seasoning is the major key. There is nothing worse than bland food. 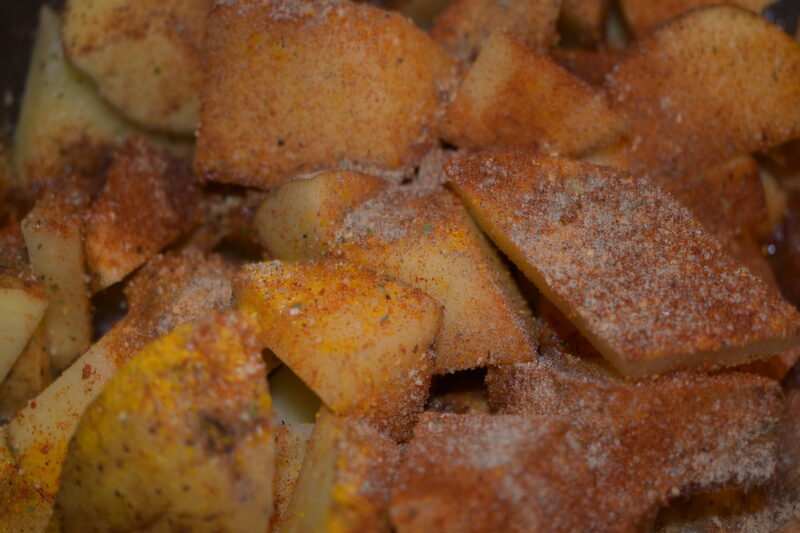 Potatoes are a starchy food, so they can handle a good amount of seasoning without it being salty. You will need to taste for salt at the end after you’ve added the tomato sauce. 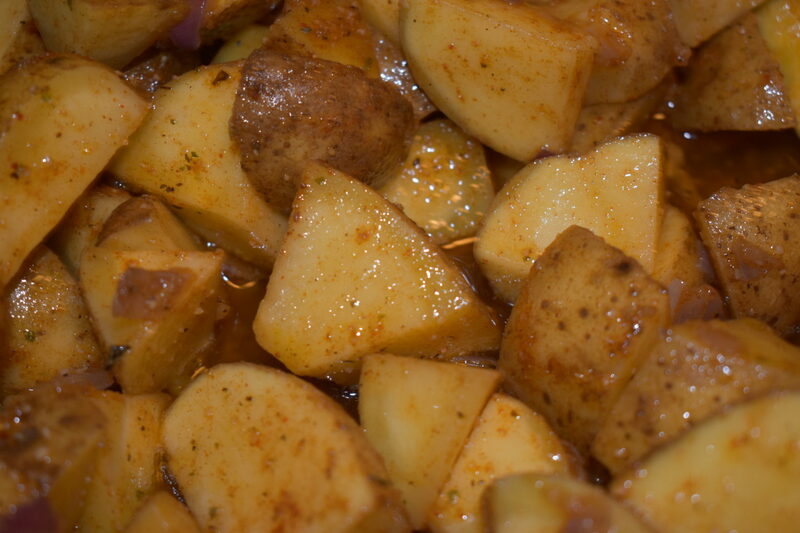 Caleb and Joshua are not huge mashed potato fans, but they have come to love when I make this potato recipe instead. They are usually the barometer for my recipes, LOL! After stirring in the dry seasonings, let it cook for a few minutes so all the flavors can come together. Then I add the tomato sauce. Any regular marinara sauce will do. If I have tomato paste on hand, I will use that sometimes instead. Just be sure to dilute it with some water. When you add the tomato sauce, you can cover the pot and let them do their thing. Usually, 20-25 minutes on medium heat will do. The aim is for them to be fork tender, not falling apart and mushy. They will be so flavorful and make a great side dish or eaten alone! 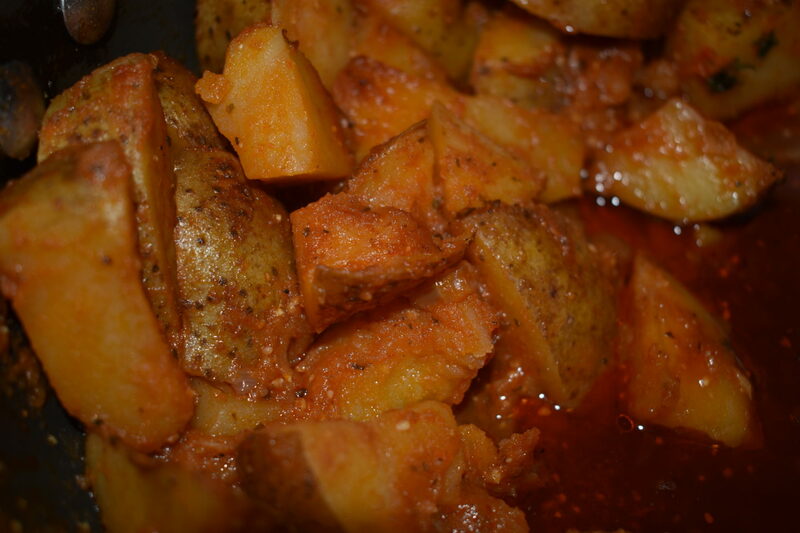 Let me know what other potato recipes I need to try, and be sure to let me know if you try this one!